Celebrate February and March with Bonanza and The Wine Shop! The Wine Shop stocks a vast range of wines from South Africa, Chile, Italy, France, Spain and Argentina, and has become a permanent and appreciated presence at most social and cultural events in Lusaka and Zambia offering wine tasting and promoting the culture of drinking wine. And now, The Wine Shop is giving you more reasons to sip away, this time on Stellenbosch South African wine, Simonsig! 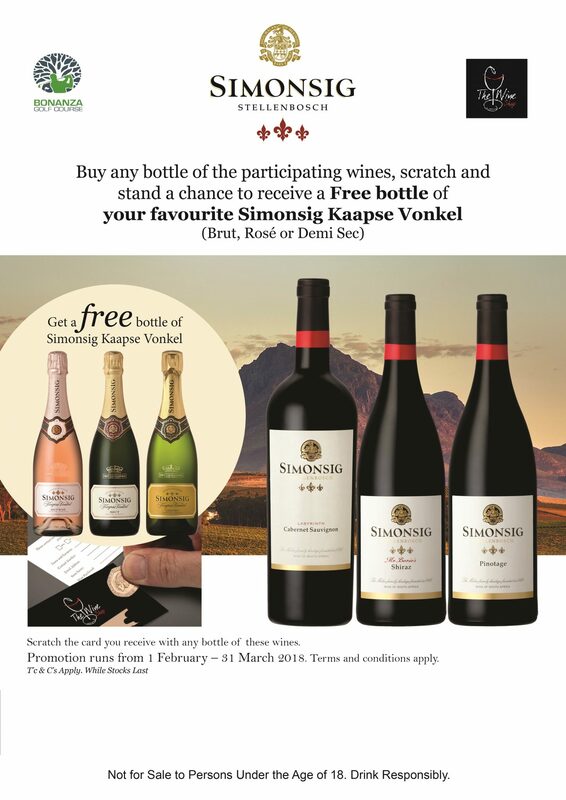 Buy any bottle of the participating wines, scratch and stand a chance to receive a FREE bottle of your favourite Simonsig Kaapse Vonkel. The perfect balance of elegant wine, beautiful scenery and the tranquil environment at the Bonanza Clubhouse.